You are here: Home / Ethnic Groups / The People of Sumatra / Who are the Palembang? Palembang is the name of a city and a people group. The Palembang people live in Palembang as well as several other areas. The Palembang are sometimes called Melayu Palembang or Musi Banyuasin people. The Mesuji can also be considered a part of the Palembang. 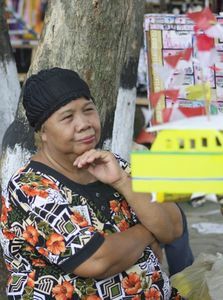 In the city of Palembang, they live in groups and are spread across the region. They live in several subdistricts in the Ogan Komering Ilir District. They also live in subdisticts in the Musi Banyuasin District. They use the Malay Language with a Palembang dialect. The language is easy to master for those who can speak Indonesian. However, their language also has some special characteristics. For example, they do not roll the letter ‘r’ like the other languages and they add the letter ‘o’ to the end of words. Rivers are important for the livelihood of the Palembang. They use it for selling on the boats, transportation, planting rice, bathing, washing, etc. Many of the Palembang people work as government workers. They also work well in a variety of other occupations, such as market traders, factory workers, teachers and handicraft producers. A typical Palembang house is designed with a distinctive pyramid shape. Most of their houses are raised. This method protects the homes from the frequent floods. The Palembang are acquainted with the tradition of “free marriage.” This means that a child is free to draw the family lineage by choosing his family name from the father’s or the mother’s clan. Other traditions are also free. For example, the newlywed couple is free to live where they want or in a place that has been determined beforehand through discussion with their parents. For the Palembang people, the wedding ceremony has a very important meaning. It is a symbol of bringing into existence unity, togetherness, and mutual assistance. The Palembang follow the Muslim religion and believe that to follow Islam is to practice all of the religious duties. Friday afternoon is a quiet day because most of the men are involved with their Friday ritual prayers. For the month of fasting, the majority of people fast diligently. Although Islamic awareness is very high, the role of the shaman is still prominent in many areas of life. For example, if something is lost or someone is sick, a shaman is usually consulted first. The shaman has a respected social status and is highly regarded in the opinion of Palembang citizens. Rice cultivation irrigation techniques are needed for those who live beside the river. At present, rice is only harvested once a year. Also, techniques need to be developed for draining water from the river into the fields during the rainy season or times of flooding as well as irrigating the fields during the dry season. With this kind of technology, the Palembang could harvest rice two or three times a year. Also, assistance eradicating the high population of rats would be very helpful to increase rice production.